On November 17, OPB’s Oregon Field Guide aired a special 1-hour look at the Columbia River Gorge Scenic Act, commemorating the 25th anniversary of the legislation. The show provides a comprehensive look at the history of the Gorge Act, its friends and foes and some of the future challenges, including those never anticipated when the legislation was written — such as the recent land rush for wind turbine sites. Several of the most prominent early defenders of the Gorge are included, including Chuck Williams and Nancy Russell. The program also includes in-depth look at the Native American legacy in the Gorge, and the ironic effect of the Gorge Act bringing a surge of new residents since it was signed into law — all seeking a life amid the scenery, and bringing demand for hundreds of new homes and new industry to a new level in the Gorge. The program overlooks the massive increase in recreation demand over the past three decades, and the lack of trails to serve the crowds. Not much attention is paid to the future role of federal stewardship in the Gorge, and especially the national park vision that Chuck Williams advocated during the fight for protection. Likewise, Senator Bob Packwood is given too much credit for passage of the Gorge Act (in his own words, of course, in typical Bob Packwood form), while Senator Mark Hatfield is not given enough. Had Hatfield been alive to comment, he would undoubtedly have given a humble account of his key role in developing the legislation. 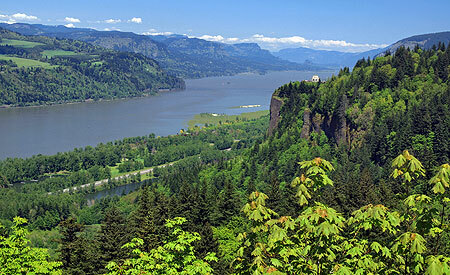 This political history might make for a future documentary on the evolution of the Gorge Act, itself, perhaps based on Carl Abbot’s book Planning a New West: The Columbia River Gorge National Scenic Area. 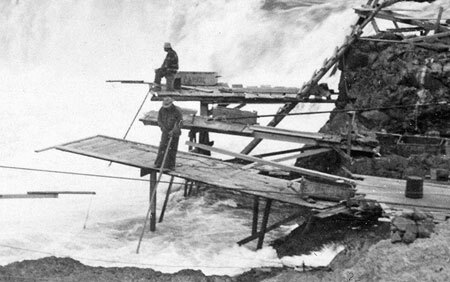 Celilo Falls has always been phantom of history to me, since I born a few years after the U.S. Army Corps of Engineers buried the falls behind The Dalles Dam in 1957. My understanding of the falls and the loss it now represents has come from old photos and maps, and a few shaky film images. Yet for many, the falls and the native culture surrounding them are alive and vibrant in their memories, thanks to seeing and experiencing them first-hand. For Native Americans, the vivid memories only add to the pain of losing a place that quite literally defined a people for millennia. The idea of restoring the falls — even temporarily — has been suggested over the years, usually to be slapped down quickly by the Corps of Engineers as unfeasible, or even dangerous. In the late 1980s, a brief, 30th anniversary movement to temporarily draw down the pool behind the dam briefly gained local momentum before the federal agencies killed any talk of the idea. 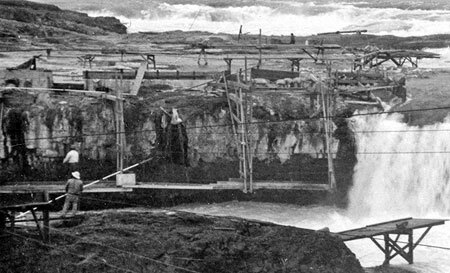 The Corps likely realized that revealing the falls to the public even once could make it politically impossible to ever refill the dam again. The hostility of the federal agencies toward even acknowledging the falls fanned the rumors among the local tribes that the falls had, in fact, been purposely destroyed by the Corps of Engineers just before they were inundated. This rumor persisted until last year, when a new mindset among Corps managers spurred the agency to compile a comprehensive sonar map of the falls to show that they are quite intact, beneath the still surface of the reservoir. The sonar confirmation of the intact falls has breathed new life into the hopes of many that the falls will not just someday be restored, but perhaps someday soon. This is where the restoration of Celilo Falls fits within the scope of the MHNP Campaign: the emerging environmental theme in the coming century is restoration, and no place in the Pacific Northwest is more deserving — perhaps even the nation, considering that 11,000 years of Native American culture at Celilo makes it the oldest continuously settled place in North America. But the connection to Mount Hood is even more elemental: the mountain towers over the Celilo country like a beacon, and has been a similarly important feature in the culture of Lower Columbia tribes. Celilo and WyEast are connected, and so their restoration should be. A joined effort to heal these places expands the possibilities for both. 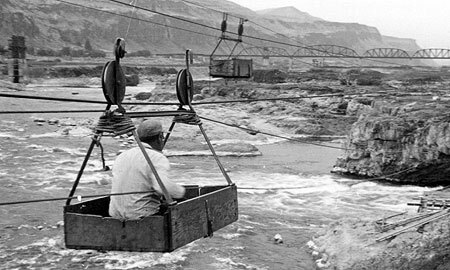 What will a restored Celilo Falls look like? Initially, it will likely be mineral-stained and muddy. But the new sonar maps confirm that silts have not overtaken the falls, so if the pool behind The Dalles Dam were simply lowered today, we would see a largely intact falls — perhaps even with traces of the cantilevered dip net fishing structures that once clung to the rocks around the falls. And over time, the falls would quickly recover to blend again with the surrounding landscape. What would a restored Celilo Falls mean for the mid-Columbia economy? The immediate impact would be on power supplies, and it is unlikely that the falls could ever be restored without some alternate energy supply — perhaps a wind farm of equal wattage? — ensuring that no net loss in energy production would result. 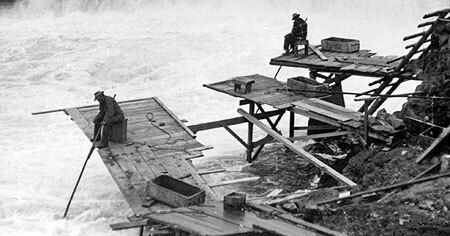 The next big question would be impacts on shipping, but the good news here is that barges were already using the Celilo Canal to bypass the falls long before the dam was erected. The canal system would conceivably resume this function, if the falls were reborn, albeit with likely improvements and modernization. 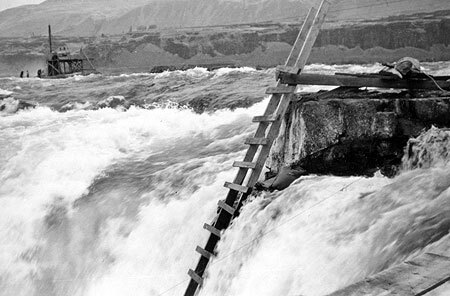 What kind of protection should the restored Celilo Falls receive? That part is easy. The astonishing scope of history tied to the falls easily qualify the site for World Heritage status within the U.S. National Park System, perhaps as a National Historic Site. This would put the restored falls in a category with places like Mesa Verde, in Colorado, and provide the needed framework to preserve and understand the historic resources that lie beneath today’s reservoir. 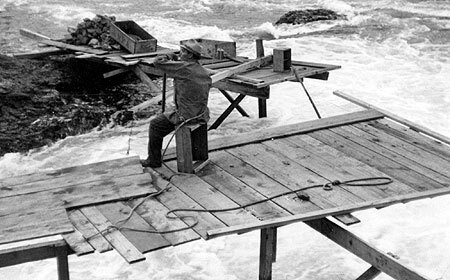 Restoration of Celilo Falls is a long-term dream of so many, but movement in that direction really began as soon as the falls disappeared in 1957. The falls has never left our collective consciousness, and thus demands restoration. 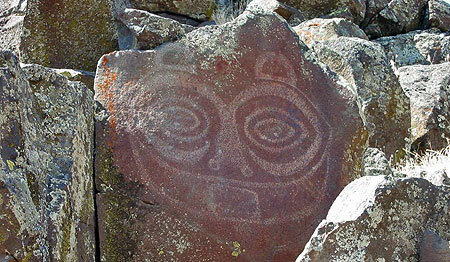 Another small step toward restoration will occur in 2009, when the commemorative Confluence Project will bring an art installation to Celilo. The project is marking the two centuries since Lewis and Clark passed through the region, and the millennia of human history that makes Celilo unique. A small step, but also a bit more progress toward what I believe will be the inevitable restoration of Celilo Falls — under the gaze of a restored Mount Hood.